Since 1951, Gregory Poole has been striving to bring our clients in the government and defense sectors the latest and most sophisticated diagnostic tools available. We are proud to offer Cat® Scheduled Oil Sampling (S•O•S) — an advanced program that forms the basis of a complete, proactive fleet management solution. What Is Scheduled Oil Sampling? 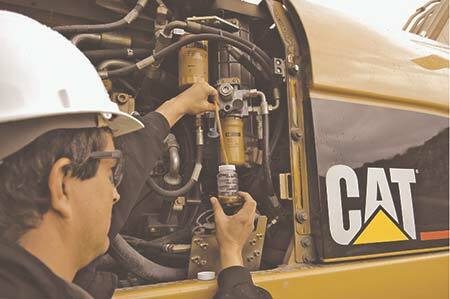 Scheduled oil sampling is a way of tracking the key health indicators of your equipment. Using S•O•S, we can see the composition of its oil, coolant and hydraulic fluids, tracking changes over time. As wearable parts deteriorate, they release trace amounts of various metals into the fluids of your heavy machinery. By tracking the levels of these metals, it is possible to know with accuracy when a part is about to fail, so you can schedule repairs accordingly. Oil sampling can be informative when diagnosing a problem. For maximum effectiveness, however, you should do it at regular intervals to establish a baseline and monitor it over time. Convenience — You’ll find convenient sample drop-offs at any of our 16 locations. Web-based reporting lets you access results as soon as they are available. Fast turnaround times — Generally in 24 hours or less, you’ll have the results you need. Expert advice — Our team knows Cat equipment better than anyone else and can analyze sampling results to provide clear recommendations based on our understanding of your fleet. Long-term support and results tracking — Fluid analysis is an important part of any fleet management or preventative maintenance program. Let the service experts at Gregory Poole put together a package that works for you. Today’s Cat equipment is more powerful than ever. You need sophisticated diagnostic tools to keep your fleet running its best. The Cat S•O•S program can help you maximize up-time by anticipating when repairs are necessary, avoid unnecessary expenses or interruptions, and lower your overall operating costs. For today’s government contractors, these are all powerful advantages that contribute to your long-term success and profitability. Contact us today to learn more.